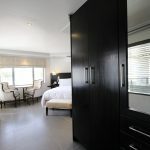 Our luxury hotel room is furnished with luxurious finishes is suitable for corporate and leisure stays. The hotel room has a separate bathroom containing a spacious shower, toilet and basin. 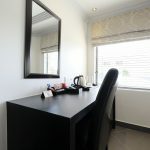 The bathroom is equipped with bathroom amenities and a range of towels. 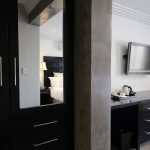 The luxury hotel room is fitted with either a queen size or king size bed, LCD TV connected to satellite TV, air-conditioner (warm and cold), bar fridge with mini bar, coffee making facilities, multiplug suitable for foreigners and hairdryer at the dresser. The room size is ±27sqm. LCD television with satellite channels. Bathroom with shower, toilet, basin and shaver plug. Multiplug consisting of international adapters and USB. Refrigerator, and coffee/tea making facilities. Air-conditioning – hot and cold. Non-smoking. Smoking area available on balcony. Laundry and dry cleaning available at a cost. 47A Athol Oaklands Drive, Melrose, Johannesburg, South Africa.